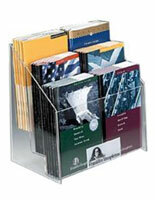 These tier leaflet holders are part of a great collection of office displays. 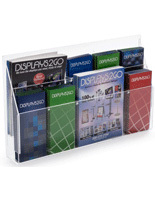 The multi-pocket designs are perfect for organizing and displaying lots of tri-fold and catalog literature in one place. 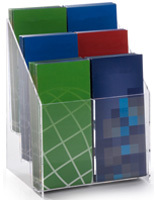 Each leaflet holder, also known as a literature display, features a "stepped" layout that keeps information easy to see. These steps, or tiers, allow for comprehensive arrangements that entice onlookers. 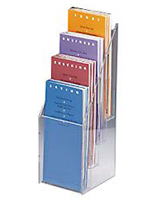 The plastic leaflet holders elevate the presented information, so it is accessible as well. 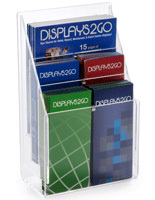 Many office workers, business managers, and sales representatives position the tiered leaflet display systems on busy service counters and help desks to further inform their clients. 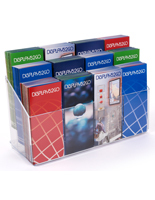 There is a vast amount of possibilities for the pamphlet racks, so users are able to create customized and targeted sales presentations with little effort. 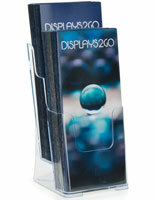 Advertise new products, services, or the latest promotions with these exceptional flyer dispensers. 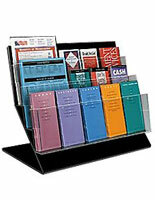 Are these multi-pocket literature displays designed for countertop or wall use? 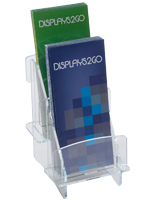 Both tabletop and wall mounted leaflet holders are available in this selection. One of the reasons our clients continue to shop with us is that a lot of our products are engineered for multiple uses. 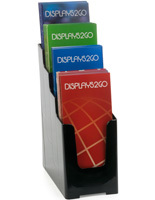 Not only are there counter and wall mounted dispensers, but also there are some units that feature both capabilities. 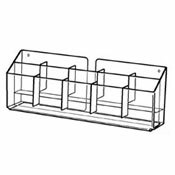 These are very special designs that offer users superior functionality as well as choice when deciding where to place them. 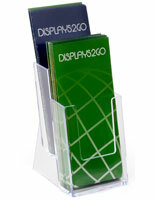 In addition, retailers and office managers can change how the holders are displayed down the road. 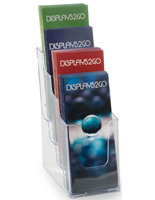 When new promotional information or tri-fold literature needs to be distributed, the user can simply rearrange the pamphlet pocket display as needed. From countertop to wall and back again! We've got you covered. 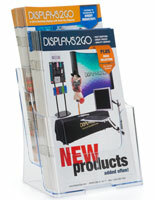 Displaying literature prominently helps ensure that the information gets the right amount of exposure. The steps on these holders create a sort of upward angle the provides better visibility. 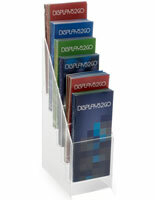 Each stack of tri-fold literature or letterhead sized catalogs is positioned in such a way that the face is visible. This way, making a selection is much simpler for bystanders or passersby. 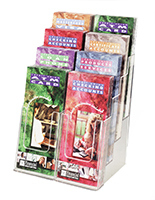 The design is enhanced even more when the leaflet displays are put on an obvious counter or positioned along a prominent wall. Help desks, checkout counters, retail sales floors, and other locations give the information more prevalence, so no one can miss it even if they tried! 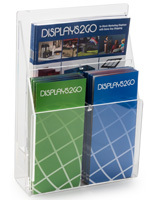 What size reading materials or publications can these brochure displays hold? 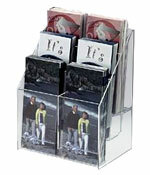 Many of the flyer racks are designed to fit the most basic brochures. 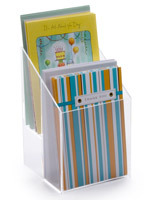 The standard size is commonly referred to as "tri-fold" printing. Usually the dimensions are 4" x 9". 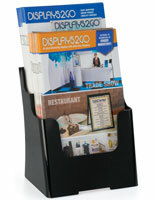 Some designs are capable of holding magazine and catalog sized information. 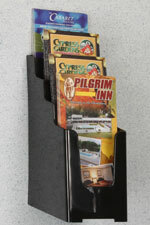 Letterhead sheets and documents measure 8-1/2" x 11" and fit perfectly inside these pockets. Other configurations are made for holding more than one type of literature. 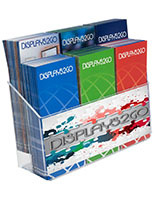 Most of these units will accommodate both standard sized brochures as well as typical magazines or catalogs, which make them ideal for locations looking to distribute a lot of information. 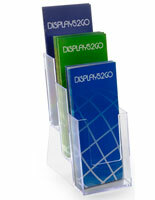 Additional options are sized for wide-format brochures, measuring about 5-1/2" in width. 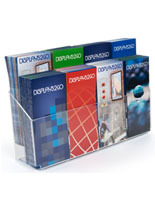 Booklets, leaflets, flyers, and other promotional information fits neatly into the pockets for a professional presentation every time. 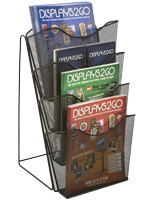 Brochure racks are a great way to condense all of your literature. 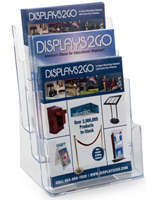 Why not give your customers a one-stop shopping location for all marketing materials is with a brochure display or pamphlet rack. 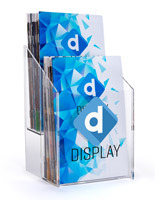 Elevate your printed materials and bring them to the attention of your customers. 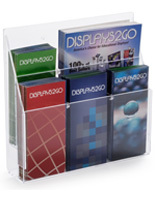 These portable countertop and wall mount models can be used everywhere from retail stores, office desktops, school entryways and right in your own home in some cases. 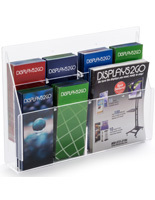 Shop our assortment of hundreds of options including single and multi-pocket flyer holders. 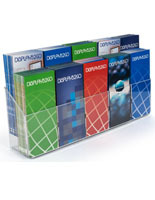 As a manufacturer of acrylic literature racks, many of our products are always stocked and ready to ship out now. 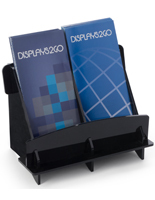 Any of these fine fixtures will help you create the perfect point of purchase promotion for your business. Most of these units ship the same day when ordered before 3PM EST! 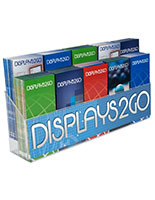 Displays2go provides a full spectrum of point of purchase exhibits that can be seen at our main shopping categories page. Need more marketing solutions and ideas? 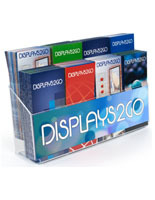 Visit our home page for a brief overview of some of our most popular POP displays.